Family Fishing trips in Exmouth! Here at Exe Fishing we provide fun and friendly fishing trips for everyone! Suitable for all ages and abilities these trips are a great way to get out on the water and spend time together away from all the hustle and bustle of daily life. If you would prefer not to fish you are more than welcome to join us as a spectator and just sit back and enjoy the views! Our Southern Angler was originally a ferry in Fleetwood and has been part of the Exmouth seascape for many years. Well known and well respected in the local community, she offers everyone the opportunity to get out on the water to enjoy the fishing and soak up the stunning scenery. Its always worth noting there is no cover on Southern Angler, so like fishermen, you will need to dress appropriately for the weather you are sailing in! We have a small selection of light refreshments on board and yes we also have a toilet! No matter what fishing skills you have – whether you have never ever fished before or you are a salty veteran of the sea, we offer fishing trips for you! Our friendly crew love what they do and are on hand to give as much or as little help as you need! 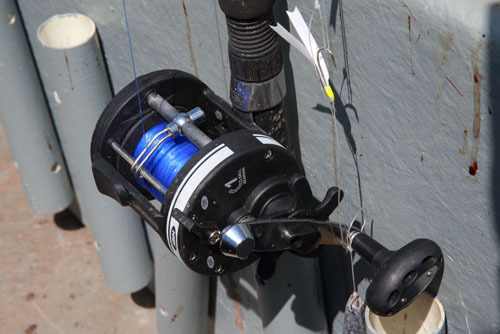 You can rest assured that we include all of your tackle and fishing equipment in the cost of your trip – so there’s no hidden charges! With us, you get to keep all you can catch! 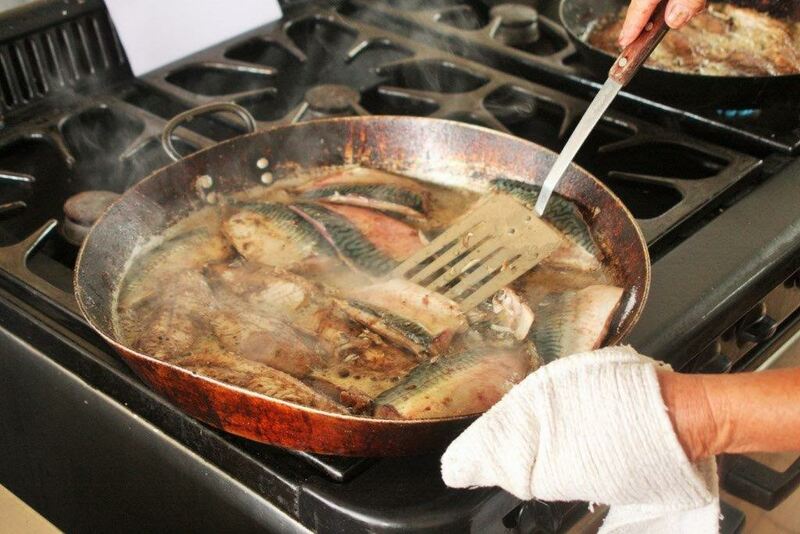 And what’s even better, we will gut and prepare your fish for you on the boat so you can just simply enjoy! 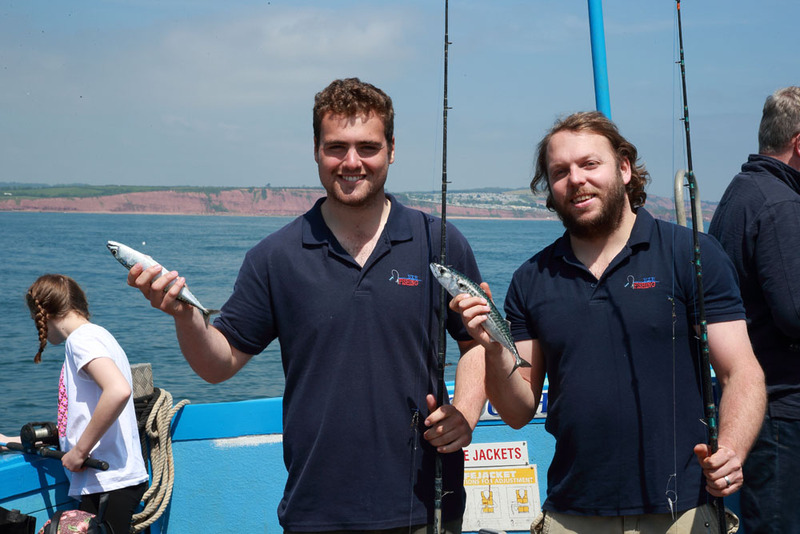 Sailing on the Southern Angler, our traditional wooden fishing boat, we offer fishing trips from Exmouth seafront that everyone can enjoy! 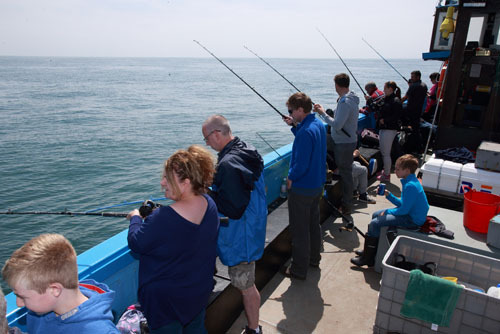 We have everything you need for a fabulous fishing trip, all rods are provided and whatever you catch you can keep – we can even prepare the fish for you whilst we are on board so that you can cook what you’ve caught as soon as you get back on dry land! For those budding sailors amongst you, there is also an opportunity to drive the boat and learn a bit about the waters in this area. Our trips are based along the gateway to the World Heritage Site Jurassic Coast that spans 185 million years of earth’s history. We also venture along the mouth of the award-winning River Exe, a Site of Special Scientific Interest for its wildlife and nature. With such beautiful scenery these trips will certainly provide a feast for your eyes! 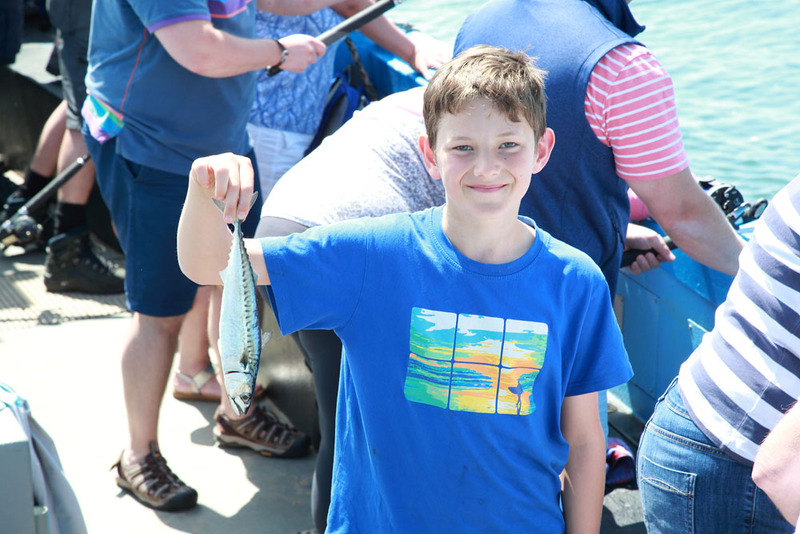 We offer both mackerel and reef fishing trips during the Summer months with room for 25 people fishing and a further 15 spectating. 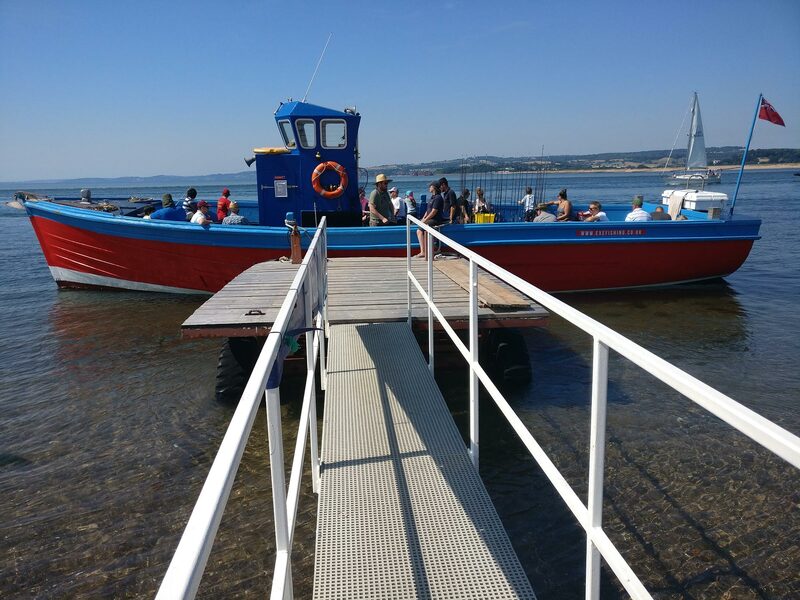 Based on Exmouth Seafront along the two miles of sandy beach is our booking hut, from where we operate our purpose-built landing stage for you board the boat. There is a car park opposite us, alongside Queen’s Drive Space and next to our favourite neighbours – the Ice Creamery! 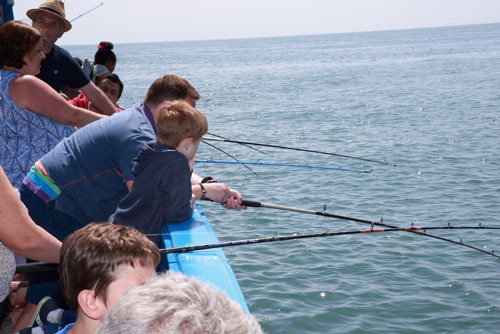 Our aim is for you to have a super relaxed and family friendly fishing trip. Spending time together on the water, doing something hands on together and away from all the hustle and bustle is sometimes just the tonic we all need! We have a small selection of refreshments on board and yes we do also have a toilet! Please bear in mind that our boat does not have any cover and you will need to dress appropriately for the weather conditions we are sailing in – don’t forget it will always be a tad chillier out on the water! So why not take a look at the timetable and book your places – we look forward to welcoming you on board!